This week we read, “How Full is Your Bucket? For kids.” In this story, we learned that each of us has an invisible bucket we cart along with us everywhere. With each negative interaction or event drops of “water” drip out. When your bucket is empty, it can be hard to be kind or helpful. It can also make you feel sad or irritated. On the other hand, with every positive interaction or event, our bucket fills up. We also found out that when we are kind or helpful to others, not only do we refill their bucket, but add new drops to our own, too. Some days, your bucket seems to be leaking like a sieve. Your alarm clock didn’t go off. You burnt the toast. Your dog stepped in the mud and then jumped on your pants as you walked out the door. All of these tiny little things take from your bucket. Children and adults are more quick to anger, irritate, judge, and outright react without thought when their bucket is empty. We’ve been noticing when our buckets are losing water and when we can help fill another person’s bucket. Today on the playground, I saw children filling buckets by sharing binoculars, taking turns on the swing, helping others build once a building had collapsed, and by inviting friends to join them in play. If you notice your bucket is a bit low, try a small act of kindness. You’d be surprised how quickly it will fill back up. Princesses can never get dirty. I was a bit thrown by a comment made during a small group discussion today. I’ll try to replicate the conversation. Of course the names have been changed to protect the growing identities of our young social scientists. Let’s call them Marcella and Hildegarde. The two children were discussing the action in a plot they were creating. Hildegard: The boys can go out and do hard work and build. And the girls can have tea parties. Mrs. Forst: Girls can build and boys can go to tea parties. Marcella: (scoffs) Princesses can’t build. They NEVER get dirty. Mrs. Forst: What if they want to go milk the cows. Marcella: (aghast) They don’t do that! That’s what villagers do! Mrs. Forst: What if she puts on work clothes so she can go do some work? Marcella: She can’t dress like a villager. That would be hideous. They [princesses] never wear “ragedy” clothes. The conversation that followed included Marcella’s definition for “ragedy” (torn and ripped up and dirty) and an emphatic group agreement that princesses would never do actual work. I countered with a few questions. If a princess has to stay clean and fancy all of the time, does she ever get to have any fun? At some point Marcella and Hildegarde identified themselves as villagers. I asked them if they ever wore “ragedy” clothes. Of course, the answer was a resounding “No!” Being five years old, they didn’t notice the gap in their logic. Hildegarde: It doesn’t really matter, because the villagers are in charge of the whole kingdom. Mrs. Forst: Why is there a princess, then? Hildegarde: (exasperated) All castles have princesses. 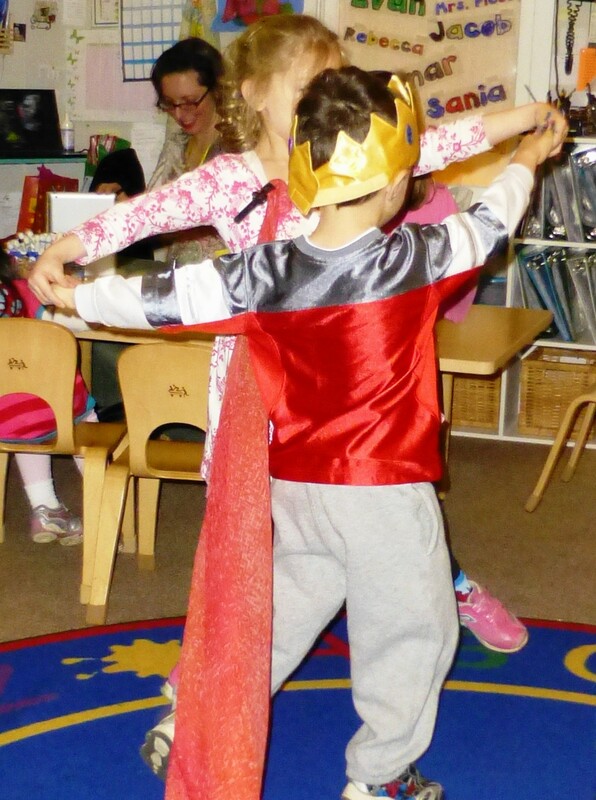 In our class, we are encouraging all of the children to explore many different roles as they play. We want them to know that all options are open for princesses, princes and villagers. Women build things. Men design dresses. Girls design computer software and enforce laws. Boys sing and create dazzling culinary feasts. Humans create. Princesses are not made of glass. They can get dirty. They can wear work clothes (without any rips and holes) and they should never be forced to stay in the tower, segregated from the rest of the world.